With first-time feature director Carlos Lopez Estrada at the helm, friends/screenwriters/producers/stars Daveed Diggs and Rafael Casal collaborate on “Blindspotting,” one of the year’s most innovative and thought-provoking movies. Just as given to imaginative flights of fantasy as Boots Riley’s “Sorry to Bother You” -- another Sundance premiere examining the twined Romulus and Remus of race and Oakland, California -- “Blindspotting” skips Riley’s wild swerve into science fiction, opting instead for an equally creative technique and style. Bursting with poetry, the film covers a huge amount of ground, from gentrification to cultural appropriation to privilege to police brutality and more, all expressed through the dynamic relationship of childhood friends adjusting to the rapid changes in their lifelong domain. “Hamilton” Tony-winner Diggs plays Collin, wrapping up his final three days on probation, under curfew, and at a halfway house. Casal is Miles, the hot-headed but loyal partner whose hair-trigger volatility and questionable decisions are a constant source of stress for the calmer Collin. The two men work for Commander Moving, a real company playing a version of itself among production designer Thomas Hammock’s many brilliant touches of anti-tourist civic presentation. That particular occupational assignment is a savvy one, as Collin and Miles witness firsthand the clash between the neighborhoods they knew and the encroachment of the new Oakland’s turn toward expensive condos and upscale shops. Neither Diggs nor Casal had a background in screenwriting prior to tackling the story of “Blindspotting,” but producer Jess Calder -- who saw Casal’s spoken word videos on YouTube -- encouraged the men to build a script incorporating the rhythms and cadences of verse. The result, which boldly embraces the Shakespeare-meets-hip-hop presentation of core ideas via unexpected linguistic bursts in sequences reminiscent of numbers in a musical, makes room for some artistic subjectivity that never tramples on the grim realities of tough moments, like the scene in which Miles’ young child finds his father’s gun. The movie balances the heaviest melodrama with consistently successful humor. The interactions between Collin and Miles bounce from the mundane to the perilous, and the familiarity stemming from the longtime friendship of Diggs and Casal treats the viewer to an easygoing, intimate rapport that echoes the deeply social bonding of Cassavetes and Poitier in Martin Ritt’s “Edge of the City,” minus the degree of that film’s coded homoeroticism. 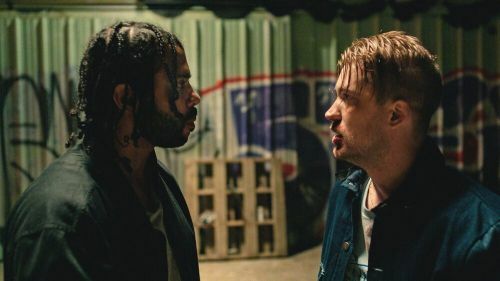 Clearly, Collin and Miles love each other, and “Blindspotting” articulates the depths to which the dual protagonists are willing to protect one another as well as the costs of that allegiance. Several critics have argued that the bluntness with which “Blindspotting” communicates, coupled with the earnestness of the climax, diminishes the movie’s impact (Emily Yoshida, for example, dislikes the application of the onscreen freestyle, claiming that its use “...starts off fun and ends up feeling like homework” and Alissa Wilkinson reads the conflict as “a tad ham-fisted”). I thought the choices made in the final scenes were perfect, and worked precisely because the outcome of events defied the likely or “realistic” conclusion. Ethan Embry, who plays Officer Molina, shares a tremendous performance, but to reveal more would spoil the experience of those viewers open to the film’s peculiar satisfactions.